Old School Style Hip-Hop Charts at #22 ! "Like Eminem, Greenie pulls no punches when it comes to certain topics, be it the examination of America’s war tactics in “Real Terrorism,” confronting a racist father in “My Son, The Schvartze,” or the lyrical skewering of Judeo-Christian ethics in “Already In Heaven.” However, happy endings are hard to come by in Eminem’s world, whereas Greenie seems intent on working towards them, no matter how painful the process might be." > Watch The Krs-One / Greenie "Real Terrorism" Video That Was BANNED ON YOUTUBE FOR SHOCK VALUE...HERE! so severe that it was nearly impossible for him to even speak. of one of history's greatest emcees: Blastmaster Krs-One. A desperate housewife jerked Greenie off into her unsuspecting husband's dinner salad while the poor man worked. 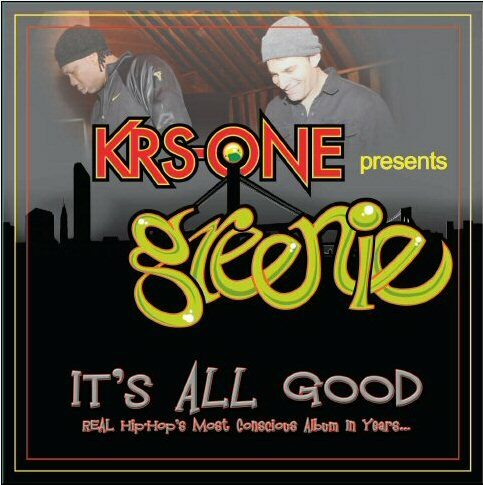 Download The 2010 Hip-Hop Album "It's All Good" to hear the FULL story and be moved, inspired...and AWED by what Rap Weekly magazine calls "unusual skill.."
"It's ALL Good" is one of the hottest online pre-selling hip-hop albums EVER! Busy Bee, and more! The album debuts a powerful, unique emcee from whom consciousness pours: Greenie. Get this album and Support REAL Hip-Hop & Street Entrepreneurialism!